Amid the existing Western sanctions and recent attacks of some US media, regarding with Russian activities in the US uranium market, Russia plans to find alternative ways of uranium production during the next several years. Due to a ban on the supplies of uranium to Russia, which was recently imposed by the governments of some Western countries, and in particular Australia and expected difficulties with its further supplies from the US, Russia is considering other options in order to meet its uranium demand. One of such options involves the establishment of production in Mongolia. Preliminary decision, regarding with this, has been taken during a visit of Russia’s President Vladimir Putin to Mongolia last year, while the initial agreement on this was signed by the governments of both countries as far back as in August 2009 during a visit to Mongolia of Russia’s Prime-Minister Dmitry Medvedev. It is planned that implementation of the project will involve participation of ARMZ Uranium Holding Co., a Russian uranium mining company, which operates the country’s uranium mines and which is part of Russian nuclear giant Rosatom. Under the terms of the project, investors will focus on the exploration, mining and processing of Dornod, Mardan and Gulvan-Bulak uranium fields in the country. Present Mongolia is considered as one of the world’s most promising countries for uranium production and the development of local uranium fields may fully meet Russia’s uranium needs for the next several years. Currently there are six layers of uranium in the territory of Mongolia, which contain more than 100 uranium fields. According to estimates of the Russian Ministry of Natural Resources, at present Mongolian uranium reserves are estimated at 120,000-150,000 metric tonnes, while in the case of unproven reserves these figures may reach 1.4 million tons, which makes the country the world’s 5th largest producer of uranium. In addition to Mongolia, as part of the plans of Rosatom’s ARMZ is the development of uranium fields in Kazakhstan, (another world’s leading region, in terms of uranium reserves) as well as acceleration of development of domestic fields. One of such fields is operated by ARMZ’s Dalur plant and is located in the Kurgan region of Russia. As part of the company’s plans, the production at this field is expected to be increased up to 600 tonnes of uranium during the next several years. In addition to Kurgan, as part of the plans of ARMZ is the increase of uranium production at Priargunskoe Mining and Chemical Combine, which operates two uranium mines. Finally, the company plans to start preparations for the development of the Khiagdinskoye uranium field in Buryatia, the Russian region, which is located in the south-central region of Siberia along the eastern shore of Lake Baikal, and which is planned to become a center of uranium production in Russia during the next several years. The project is expected to be implemented by ARMZ’s local Khiagda subsidiary. 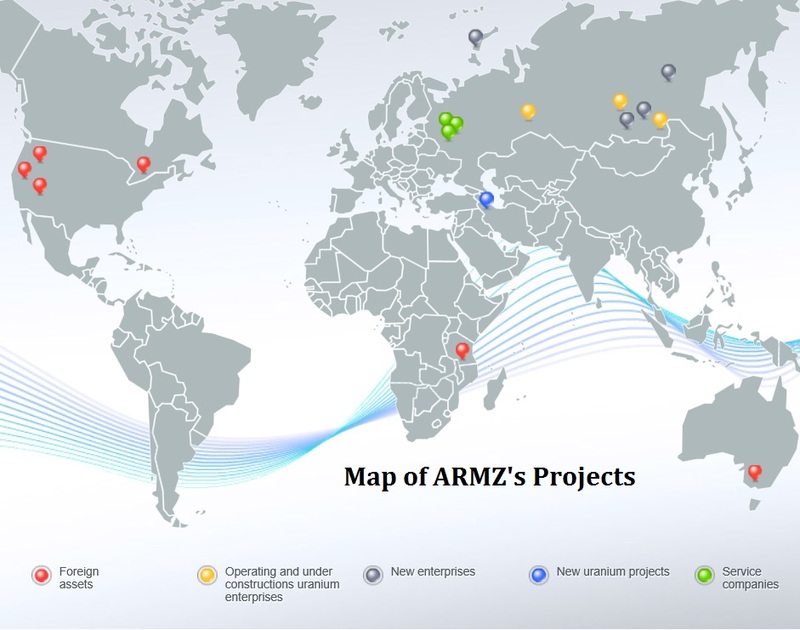 According to plans of ARMZ Uranium Holding Co., diversification of production and the expansion into new regions will help the company to implement its ambitious goals, which involve the reduction of the cost of uranium production by 35% and doubling the total revenue of the company over the next five years, according to the company. In the long term, by 2030 the company’s annual revenue should increase by six times.